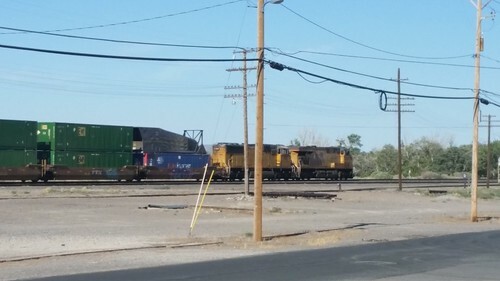 Today, as Lisa and I gingerly made our way back from the post office in 39°C heat, we saw a relatively rare visitor to our part of the railroad world. 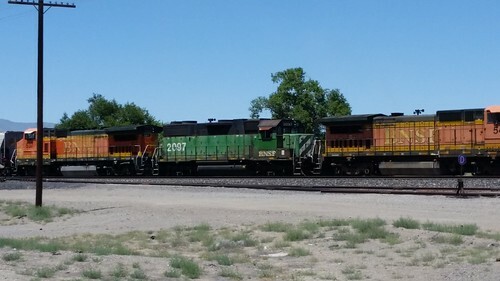 While we have had a lot of BNSF locomotives here, and also some ex-Santa Fe "Warbonnet" units, we don't get a lot of ex-Burlington Northern "Cascade Green" units in these parts. Later that afternoon, Lisa spotted a piece of experimental rail equipment. Union Pacific has been experimenting with different designs of "Aerowedge" devices that are intended to reduce wind resistance to trains and make them more fuel efficient. This is a design I hadn't seen before, although Lisa had noticed it on one of its trips going the other way. With the heat, we've been mostly staying inside. The swamp cooler works okay in this dry heat, and the shelter over the travel trailer keeps it mostly out of the direct sun, so the air conditioning on board keeps Lisa from overheating. I'm glad it cools off when the sun goes down, or it would be a lot more difficult to manage.